How does a Pole saw work different or better than its counterpart’s? Well, if you saw high up on a ladder, it can be very dangerous. A good idea to avert bad things from happening is to use a pole saw. This saw works just like other types of best pole saw only that it is mounted on a long pole. This design is ideal to ensure a longer reach to the branches up high. This saw allows you to saw high branches while keeping your feet stable on the ground. It basically features a lightweight design and is mounted on a special pole, and the resulting figure is what we call a pole saw. However, the pole is usually strong and adjustable to allow greater functionality. We have different types of pole saw, and the basis for categorization is the type of engine it uses. Cordless design means that the pole saw doesn’t have a cord, and this type is considered very versatile. We have gas powered pole saw which is cordless, and their engines are the two-stroke type and only the cc that matters. On the other hand, we have electric pole saws which can be either corded or cordless. The cordless ones use strong and rechargeable batteries. 1.10.1 what is the maximum extension? 1.10.2 What is the recommended position to store the saw? 1.10.3 What is the weight of the saw & battery combined? Remington RM2599 is the ultimate pole saw that combines interesting features to grab the number one position in this review. It features an easy to use design specifically for cutting limbs and branches of trees. Regardless of the type and hardness of tree, this device provides an outstanding cutting function. Featuring a telescoping pole hosting the engine, this device eliminates the need to use ladder for you to access branches at tall heights. The engine is two cycle type and rated 25cc which means it is very powerful despite its small design. With the automatic oiler, the chain is always lubricated to allow smooth functioning. 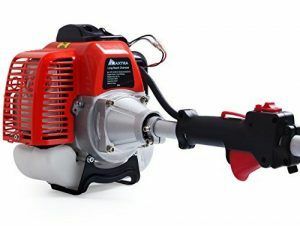 Apart from hosting a pole saw, this engine supports attachments such as blower, hedge trimmer and much more. Also, this device works with little or no kickbacks no matter the hardness of the tree you’re cutting. Thanks to the specially aligned blade ad chain and the automatic oilier. These configurations allow the device to run smoothly cutting hardwoods as if they are just soft rubbers. Moreover, the pole segment is removable to allow the device to be used in a shorter configuration. As much as you need the best pole saw with premium power, you must not forget to figure about reliability and safety of the device. 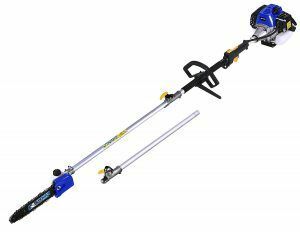 BLUE MAX 53542 gas-powered pole saw is one of the safest equipment you could ever work with and delivers excellent power. It features an automatic clutch system to allow easy starting and reliable operation. And, as you know it, gas-powered devices can be very noisy. But, this pole saw is specially designed to cut the noises low. Thanks to the anti-vibration mechanism which reduces annoying vibrations and in turn reduces fatigue. The design is carefully balanced for effective working ad fuel management. It features fuel primer eliminates air from fuel system and carburetor and facilitates easy starting. The chain speed is 4500 rotations per mite, thanks to powerful motor and this speed is great for all challenging tasks. The handle is comfortable, and the engine is very lightweight to allow easy handling and maneuverability. Being one of the newest designs on the market, Maxtra pole saw is here to change the proposition. For the first time, this pole features a humanization design that allows the user to do cutting activities safely without imposing any danger to their health. It features an air filter engine protection mechanism. It not only allows the machine to have a longer life, but it allows a clean working that is friendly to the user. By having a gas powered engine, this design relieves the stress of long cables and delivers amazing torque for you to conquer the toughest cutting tasks. Whether it is logging, wood cutting, pruning and all related tasks, this device is ready for it. The engine is mounted on a telescoping pole which can be adjusted from 8 to 11 feet to makes sure you reach the branches comfortably. For fast and stress-free starts, it combines some amazing physics. It features a two-position chock o allow easy hot or cold starts. In addition, it features a centrifugal clutch that facilities safe and easy operations. The tank capacity is half liter ad this is purpose to reduce weight. But, due to the energy efficient mechanism, this device doesn’t consume a lot of fuel. Nonetheless, the tank is translucent which allows you to monitor the fuel level as it goes down. The market is full of pole saw models, but none has ever managed to compete effectively with Green-works Pro 9 feet pole saw. With a motor rated 80 volts, it delivers massive power despite having a cordless design. This brushless motor is one of a kind since it is energy efficient and is able to run any device attached to this tool. Moreover, it has a simple use since it uses an electric start. Thus, it is safe to use, easy to operate and very comfortable. 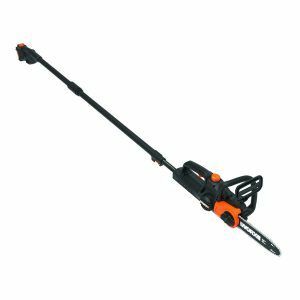 With 10 inches bar length, it can cut most of the tree branches which may require pruning. In addition, it is an ideal alternative to the standard power saws which are very heavy and really dangerous to work with. Featuring manual chain tension adjustment, this machine is safe to work with, and it allows easy cutting since you can adjust the chain correctly. Besides, it weighs very little just 15 lbs hence anyone can work with it. Maverick RM25PS from the famous Remington is here to change everything you had known about the power tool market. It has an outstanding design and functionality that makes every buyer feel comfortable releasing the dollars indicated in its price. But don’t worry; this machine is ranked among the most affordable pole saws. It features a timeless design characterized by gas engine which delivers impressive torque ad rotations per minute. The engine is two cycle and has very little maintenance demands. This gas engine is rated 25cc and release massive power to be able to deal with toughest cutting jobs. Now, the 8-inch bar and chain are specially designed to allow maneuverability when you’re dealing with limited spaces between branches. And, the whole component is mounted on 7-foot pole whose length is adjustable to fit the needs of various cutting projects. It can extend and reach a height of 12 feet making it one of the longest and most powerful poles saw on the market. What about the amazing functionality of a chainsaw and pole saw in one equipment? Well, there is no cutting task you can’t achieve with this amazing saw model. 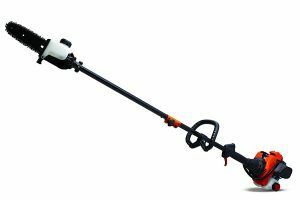 Worx WG323 cordless pole chainsaw is among the most versatile saws available on the market today. Featuring a detachable pole reaching a height of 10 feet, this is the best gift you could give on father’s day. It has the competency of reaching high branches ad feces and works well for all people regardless of the height differences. It uses a very powerful motor which boasts great speed and torque and delivers quick and clean cuts. Just like other top-rated models of its class, this equipment features an automatic chain lubrication mechanism. In addition, the auto tension system keeps the chain in good working condition even when you haven’t had time for checkups. This combination of self-repair features is to increase the durability. This outstanding pole saw also weighs very little, 10.4 Lbs allows you to access hard to reach branches. Apart from lightweight, it also features soft and comfortable over mold grip which improves handling and lets you work in ultimate safety. Using 20 volts, this machine is great, and you can use the motor with other attachable devices which use the same batteries. Thus, this is a time-saving device, and a pole saw to boast of. Pole saws are incredibly versatile power tools which homeowners value very much. You will only be able to enjoy full versatility if you’re using a high-quality pole saw such as Greenworks. 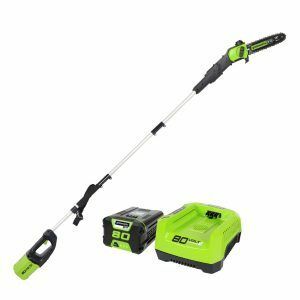 It is 8.5 cordless pole saw boasting a voltage rating of 40V. The GMAX pole saw is very versatile due to lightweight and cordless design. Besides, this 40 V battery is very powerful, and it powers multiple tools that are applicable to compete yard system. The batteries are two, and the package also includes a battery charger. Moreover, this is the best device for trimming tall branches. Green works is pretty easy in chain adjustment or tensioning. Thanks to the integrated chain tensioning system. It is effortless and very safe doing the chain tensioning and requires no past knowledge. In addition, the chain and some other moving parts require regular oiling. The manufacturer of this device already knows that, and that’s why the system features automatic oiling. This oiler takes care of the chain and bar to ensure prolonged use without quick wearing. Besides, lubrication is the main way of ensuring any engine works out fine. Now, how does it feel when fuel runs out without your knowledge probably in the middle of a trimming exercise? Of course, it is the worst encounter, especially for this pole saws. Now, this device features a translucent fuel tank. So, you can regularly monitor the fuel level. 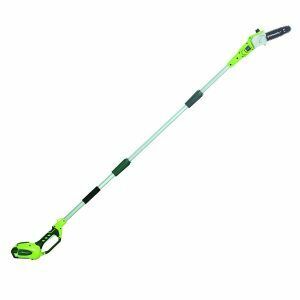 The shaft features 8 feet long so that you can trim tall trees easily without having to climb it. People look at pole saw differently depending on the intended purpose of the saw. But, we are going to walk through the basic features you need to check before buying a pole saw carefully. As we said earlier, we have gas powered, an electric pole saw. It is true that gas power pole saws are thought to be more powerful than the others. Traditionally this has been true, but for a fact, technology is quickly closing this gap. However, electric pole saw usually feature a lightweight design which is what everyone looks up to when considering the safety of cutting higher branches. Nevertheless, gas powered pole saws are great for places where access to power is impossible. For the cordless electric pole saws, you need to check the quality of the rechargeable battery. Type of motor is also related to a power source, and in this case, you should consider the brushless kind of motors since they are durable and great for tough jobs. This is another thing that manufacturers seem to mislead the buyers of pole saw. Of course, you need the highest reach possible. But, this will depend on the capabilities of the device. So, you need to determine the all-out extendable length of the pole. Most top rated pole saws support a maximum reach of 11 to 12 feet. We all have different strengths, and some people actually can work with very heavy pole saws. But, the majority will like the lightweight models which are easy to handle. Whether you want a gas powered or electric version, weight is an important consideration. If you are trimming or pruning very hard and thick branches, you probably need a very strong pole saw. In this case, and gas-powered versions are the best since they can provide the required torque. For simpler jobs, you can consider electric and cordless models. Anti-kickback features and self-lubrication mechanism are all important for a pole saw. These features among others allow safe working with the device and increase the life of your machine. Also, you need to ensure the machine has either a manual or automatic chain tension adjuster. When you ensure all the features discussed are there, pole saw will give an incredible service, and your landscaping practices will improve drastically! what is the maximum extension? This is one of the important aspects to check in a pole saw. The maximum extendable length ranges from model to model. It can vary from 7 to 12 feet depending on brand or model, and you will choose as per your needs. What is the recommended position to store the saw? Vertical position is the best, and you should hang it from the hook at the base. What is the weight of the saw & battery combined? I haven't weighed it, but I estimate about 15 lbs. If you look closely at a pole saw you will realize that it is a must have power tool for every home. Despite the fact that they are quite expensive, they are special tools that allow a more comfortable living. You can use it for commercial logging, trimming, and pruning or just for maintain your home in good condition. Besides, with gas and electric variety, you can choose the one that meets your needs perfectly. And, it is one of the most versatile tools to have at home. As you have seen, it supports different attachments. So, buying a pole saw adds a lot of economic value in your list of tools. We have just concluded reviewing top rated, and latest technology pole saw, and choosing the best won’t be a daunting endeavor anymore.